Children worshiping at a church service in China. (Xingtai, Hebei—Jan. 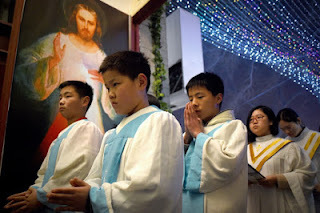 27, 2019) Chinese authorities have been intensely repressing churches in the past few years by spreading propaganda among K-12 students that religion is harmful. Multiple government departments in Xingtai issued an open letter forbidding those who are underage from accessing religious venues. The local departments of religion and education issued the open letter, entitled “Why the Underage Should Not Access Religious Venues, to parents of all K-12 students.” The officials stressed that the letter is aligned with existing Chinese laws and that separation of church and school should be implemented. They also claimed it should be the obligation of parents and schools to prevent children from having a religion or accessing religious venues. The open letter contains a list of reasons why students should not have a religious faith, including that the underage children are unable to think independently and they do not have independent civil capacity. If they are lured and forced to believe a religion and attend religious events, they are prone to be affected by illegal religious events and radical religious thoughts and their mental health and future eventually will be affected. All parents, regardless of their religion, should teach their children that they should not enter religious venues, or participate in religious events including religious trainings and summer camps, and they should stay away from all religious activities. Likewise, a similar open letter was issued in Shandong last July and in Henan last May. One Christian denounced the open letter by quoting the Constitution. He emphasized that forbidding children from religious venues is misinterpreting the laws and unlawfully stripping them of the students and their parents of their freedom of religion. Chinese authorities have continued to strengthen the crackdown on students’ religious rights since the New Regulations of Religious Affairs took effect in February of 2018.